Here is an old cliché for you. What’s in a name? Hopefully, this time, with the return of Chase The Bookseller to the book business in Boulder City, the name GoatFeathers will help attract attention and provide a convenient place for Boulder City book buyers to satisfy their cravings. Recently previewed in Boulder City Magazine as “A Boulder City Emporium” GoatFeathers appears to be the perfect place to have a book store where people are left alone to browse. Leaving the customer alone is not usually an attractive feature for a retail business owner, but if it works as I hope, it will be a positive move. Retired, which I am supposed to be, means doing what one wants without interruption from the boss, or being chained to a schedule each day, week, and year. While the last Chase The Bookseller store, which was named First Edition and located on Nevada Way and Arizona, seemed to be a fairly good location, it still didn’t provide enough walk-in traffic to pay the rent. 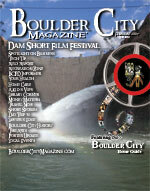 In time, I decided to close the store in favor of working more hours on the Boulder City Magazine which I subsequently relinquished to the capable hands of Brad and DeAnne Appleby. They have added more pages, more articles and of course more advertising  which is a very good thing for the businesses and the people in Boulder City. I was surprisingly enlightened during the three weeks before Christmas doing business in GoatFeathers. More than 70 books were passively sold in the Chase The Bookseller loft. That’s a happy beginning and without the use of a sales pitch. To find the Chase The Bookseller location within GoatFeathers, located at 1300 Wyoming, enter the side door, turn left toward the cashier station and follow the stairs up to the loft. You can’t miss the “Chase The Bookseller Books and Collectibles” sign on the stairway and the neon sign at the head of the stairs, which reads BOOKS. To contact Chase The Bookseller directly from your home, call me at (702) 497-3154 or visit my web site at www.chasethebookseller.com.